I love seeing your paintings but you're equally as good at photography so take more pictures please. Your bench picture and the way it catches the contrast is beautiful. This photo is lovely! 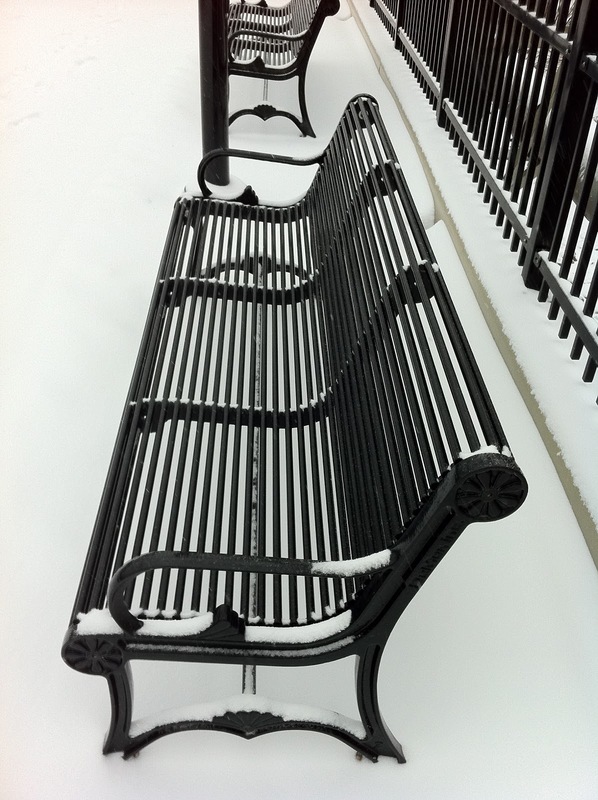 What makes it so appealing is the composition- love the contrasting, vertical lines of the fence behind the bench. It is a crisp, sharp shot. I love your fine art photography Patricia!! Would very much like to see more! I love your own artwork, but the photograph is fabulous too! May be a mix? You are an artist- whether it is with a brush or a camera, so I for one would love to see it all! This photograph in contrasts is beautiful! This is a lovely shot! Just add them to the other art work, show us both! This is so pretty! I would love to see more of your photographs. To see what an artist sees through her lens is always fascinating. I wonder how many people walked by that same bench and never even paused to see the beauty. Love this!!! Wish it would snow here. I, too, have read The Fabulous Essentials...love that book. Hope you're well my friend! This really should be framed...hope to see more of your photography. You are doubly talented...so I say bring on the photography as well as the drawings! Get off the bench and into the game. You're ready and the blog team needs your inspiration! love it.....you have such a artistic eye! I would love to see more of your photography. The bench photo is fabulous. Snap away my friend! Never stop your creative flow. Love it! You should do anything that keeps artistic juices flowing. Good for the soul!